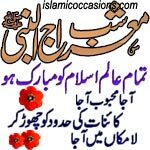 On 27th Rajab, all the Muslim believers celebrate this as a grand day of Meraj as "Grand Eid" and all the Muslims should be proud to have such a prophet like Holy Prophet Muhammad, peace and blessing be upon him and his progeny (Ahlul Bayt), to whom Almighty Allah (swt) was also proud and had invited him to visit and talked with very nearer distance as mentioned in the Glorious Qur'an (Qhaba Qhausain 53:9). Also note that, the Meraj of the Holy Prophet Muhammad, peace and blessing be upon him and his progeny has taken place more than once. However, it should be mentioned that Meraj in which the daily Salat was made incumbent, without doubt, occurred before the death of Hazrat Abu Talib, who passed away in the 10th year of Besat. Unmistakably, from the Ahadith and books of history, it is mentioned that on the night of Meraj, Allah (swt) gave the order of the five daily Salat as being mandatory upon the Islamic Nation. "This night you have to perform a very unique journey and I have been ordered to remain with you. You will have to traverse different parts of the world mounted on an animal named al-Buraq." Holy Prophet Muhammad, peace and blessing be upon him and his progeny began his historical night journey, along with the trusted protector of the revelation, the Angel Jibreel (pbuh) from the house of "Umm-e-Hani", with the aide of his steed al-Buraq. "After some time, Angel Jibreel (pbuh) stopped Holy Prophet Muhammad (saw) and said to perform the Salat. Holy Prophet Muhammad (saw) dismounted from al-Buraq and performed Salat. Jibreel (pbuh) said, 'Do you know where you just prayed?' Holy Prophet Muhammad (saw) replied to him in negative. Jibreel (pbuh) said, 'In Taibah (Madinah), that place where your travelers will go.' After this, Holy Prophet Muhammad (saw) got back onto al-Buraq and continued the journey." "Once again, Angel Jibreel (pbuh) stopped Holy Prophet Muhammad (saw) and said, 'Perform the Salat.' Holy Prophet Muhammad, peace and blessing be upon him and his progeny once again dismounted al-Buraq, and performed Salat there. Jibreel (pbuh) asked Holy Prophet Muhammad (saw), 'Do you know where you just prayed?' It is the Mountain of Sinai - the place where Prophet Musa / Moses (pbuh) spoke to Allah (swt)." "Once again, Holy Prophet Muhammad, peace and blessing be upon him and his progeny ascended al-Buraq and continued. Shortly afterwards, Angel Jibreel (pbuh) said, 'Get down and perform the Salat.' Then again Jibreel (pbuh) questioned, 'Do you know where you just prayed?' 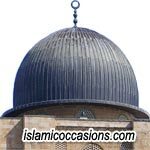 Holy Prophet Muhammad (saw) replied in negative, to which he answered, In Bait al-Laham (Bethlehem) - the place which is near to Baitul Maqdis and this is the place where Prophet Isa al-Masih (pbuh) was born." 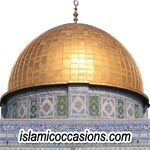 Then they reached Baitul Maqdis, which is located in today's Zionist occupied Jerusalem and is also known as Masjid al-Aqsa (the Furthest Mosque) and Holy Prophet Muhammad (saw), proceeded to tie the reins of al-Buraq to the same ring that the great Prophets (before him) used to tie their animal to. After this Holy Prophet Muhammad, peace and blessing be upon him and his progeny entered the Masjid and it was here that he met Ibrahim, Musa, Isa and the rest of the Prophets (pbut). They all gathered around him and they all proceeded to get ready for Salat. Holy Prophet Muhammad, peace and blessing be upon him and his progeny had no doubt that the Salat would be lead by Angel Jibreel (pbuh), however when the lines for the Salat were being formed, Angel Jibreel (pbuh) placed his hand on the shoulder of Holy Prophet Muhammad (saw) and pushed forward. Angel Jibreel (pbuh) also took part in the Salat behind him along with the various Prophets (pbut). On the second part of his journey, he proceeded from this spot to the skies (heavens). Holy Prophet Muhammad (saw), then observed the stars and the systems of the world and conversed with the souls of the previous prophets, and also with the angels of the heavens, peace and blessing be upon them all. Holy Prophet Muhammad (saw) saw the centre of the tortures and the blessings (hell and heaven) and became fully aware of the secrets of creation, the extent of the universe and the signs of the Omnipotent Allah (swt). Then Holy Prophet Muhammad, peace and blessing be upon him and his progeny, continued his journey and reached Sidrat ul Muntaha (Beyond this point nobody has access including Angel Jibreel (pbuh)). There he found it fully covered with splendor, magnificence and grandeur, and then he returned back by the way he had traveled. Holy Prophet Muhammad (saw), first came to Baitul Maqdis and then to Makkah. It was daybreak when he dismounted at the house of Umm-e-Hani from al-Buraq which had taken him into space. Holy Prophet Muhammad, peace and blessing be upon him and his progeny related this matter to Umm-e-Hani and the following night, he made it known to the assemblies of Quraysh as well. The word of his travels spread from mouth to mouth amongst all the groups, and now more than ever, the Quraysh were upset (with him). According to an old tradition, the Quraysh asked the account of its structure, and Holy Prophet Muhammad, peace and blessing be upon him and his progeny, not only described the physical particularities of Baitul Maqdis, rather, he even informed them of the event that took place between Baitul Maqdis and Makkah. Holy Prophet Muhammad (saw) said to them that he met the caravan of such and such tribe who lost their camel and he asked them to give him water and Holy Prophet Muhammad (saw) drank water from their container. So they asked about the Quraysh caravan and he replied to them that he saw them at Taim. So Quraysh became very excited and it was not long after that the travelers (of that caravan) reported the exact events (as had occurred). The Heavenly Journey of Holy Prophet Muhammad, peace and blessing be upon him and his progeny has been straight forwardly explained in two Surahs of the Glorious Qur'an. From this verse, we come to the conclusion that Holy Prophet Muhammad, peace and blessing be upon him and his progeny traveled with his physical body (servant) through the worlds of Ascension. Further, by the greatness of the Hidden Power, Holy Prophet Muhammad (saw) was able to complete this journey in a very short span of time. Allah (swt) starts His speech with the phrase (Subhan) which denotes the fact that Allah (swt) is free from all deficiencies - but He does not stop here. Rather, He makes the ascension the reason for His greatness by saying 'made to travel' (Isra) so that others do not imagine that the means of this journey was through causes of the natural world and with normal, ordinary means of transportation. This would have made his journey something that could have been denied. Rather, this journey was accomplished by relying upon the power of Allah (swt) and His specific and special blessings. Although this verse states that the start of the journey was from Masjid al-Haram and ended at Masjid al-Aqsa, this does not contradict the fact that Holy Prophet Muhammad, peace and blessing be upon him and his progeny in addition to this trip, also had other trips towards the higher world, since another part of the journey of Ascension of Holy Prophet Muhammad (saw) is explained in verses of Surah an-Najm. The object of this grand journey was to make known to Holy Prophet Muhammad, peace and blessing be upon him and his progeny the various aspects of the existence of the great universe. A person asked our 4th Imam, Imam Ali bin Hussain (as): "Is there a particular place for Allah (swt)?" Imam Ali bin Hussain (as) replied: "no." The man said: "Then why did He make his Holy Prophet Muhammad, peace and blessing be upon him and his progeny, journey through the skies?" Imam Ali bin Hussain (as), replied: "He made him ascend so that he might become aware of the expanse of the universe and see and hear wonderful things, the like of which had not been seen and heard by the eyes and ears before." It has been an on going discussion and debate for hundreds of years concerning the method of travel of Holy Prophet Muhammad, peace and blessing be upon him and his progeny during the Meraj. Many things have been said regarding this journey and its being physical or only spiritual even though from the Glorious Qur'an and the Ahadith there is no doubt that it was a physical ascension. However, one problem from the point of view of science prevented some people in believing the reality and thus, the Meraj of Holy Prophet Muhammad (saw) was recorded as being simply spiritual. Another group went a step further and believed that this complete event was simply a dream and that Holy Prophet Muhammad (saw) experienced the Meraj during his sleep! The heavenly journey went against the scientific and natural laws of today such as: the law of gravity of the earth; its speed of travel of 25,000 miles per hour; the weightlessness of an object that is outside of the airspace of earth; the fact that it is not possible to breathe the air that is outside our atmosphere; the various cosmic rays; meteorites and air pressure; and the speed of light that goes at the speed of approximately 300,000 kilometers a second; and other such examples. Fortunately however, it must be known that through scientific research and investigation, the space scientists of the Soviet Union successfully launched Sputnik I. The world's first artificial satellite was about the size of a basketball, weighed only 183 pounds, and took about 98 minutes to orbit the Earth on its elliptical path, on October 4, 1957. They were able to demonstrate to mankind with ease, that they could overcome such problems as the gravitational pull, cosmic rays, problems with breathing in space, and others, through various technologically designed and built equipment and instruments. Even today, the space science research is ever increasing and the scientists and researchers are confident that in a matter of time, they will be able to place life on one of the planets in our solar system; just as today, they have opened up the exploration to the moon and the planet Mars.